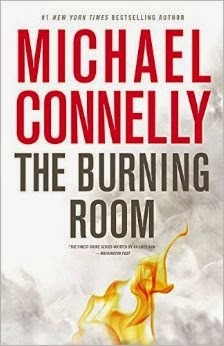 In Michael Connelly's latest, The Burning Room (Little, Brown and Company), Los Angeles Police Department detective Hieronymus (Harry) Bosch is still attached to the Open-Unsolved Unit, which is usually tasked with solving cold crimes from many years before. But in this case, the victim, a one-time mariachi musician, has just died. Ten years before, a stray bullet from a drive-by shooting had hit him. It cost him his legs and lodged next to his spine, from where it could not be safely removed, taking a decade to kill him. Bosch and his brand-new partner, newly appointed detective Lucia Soto, are assigned the case. 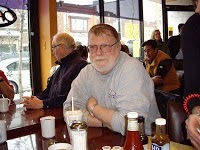 But when the bullet is finally removed from his body, it suddenly becomes clear that the victim was shot with a hunting rifle, making it extremely unlikely they’re dealing with a drive-by gone awry. Starting from scratch on a 10-year-old case is difficult enough, but Bosch is not thrilled with his new partner, who was the heroine of a shoot-out in the street, but has no experience as a detective, let alone in homicide. Bosch’s boss makes it clear that the senior detective should pass along his knowledge and skills. But Bosch soon finds that Soto has an agenda of her own: She is determined to solve a 20-year-old arson case in which five of her friends died. Bosch agrees to help her, though their current case must come first. It’s a treat – as it always is in a Harry Bosch novel – to watch the veteran detective play the system using his vast network of informants, friends and former colleagues to overcome the resistance of the police bureaucracy and the outright hostility of his bosses. The detectives’ two investigations eventually step on some prominent toes, and they are told to back off, but you know they won’t. And they don’t. 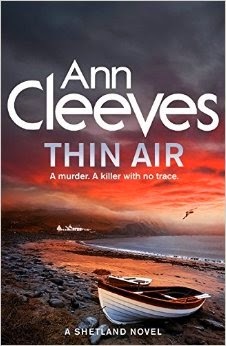 Ann Cleeves' Thin Air (Macmillan) starts with a wedding party on Unst, Scotland’s northernmost Shetland Island. A group of friends have joined with the islanders to celebrate the marriage of one of their number to a Shetlander. But on the night of the wedding, after quiet drinks on the patio of the house where they’re staying, one of them, a filmmaker named Eleanor, walks off into the darkness and disappears. The next day, one of her friends receives a cryptic message in an e-mail, saying she’ll never be seen alive again. When her body is found in small loch, detectives Jimmy Perez and Willow Reeves are assigned to the case, and along with Constable Sandy Wilson and several local police, they begin collecting evidence and interviewing those concerned. As always in Cleeves’ Shetland books, a great deal of the charm is in the author’s exposition of the nooks and quirks of Island customs and folklore, much of it by way of the quiet but always-surprising Sandy Wilson. Plotwise, complications include: the victim’s claim to have seen – and subsequent obsession with – the ghost of Peerie Lizzie, a young girl who drowned off the island in the 1920s; the complicated backgrounds and relationships of the English visitors; and the oh-so-slowly developing feelings between Willow and Jimmy, who is still not fully recovered from the death of his wife. Jimmy travels to London to interview Eleanor’s family and co-workers, but it becomes increasingly clear that her death is connected to old secrets and complex relationships on Unst – and, somehow, to the ghost of Peerie Lizzie. In M.L. 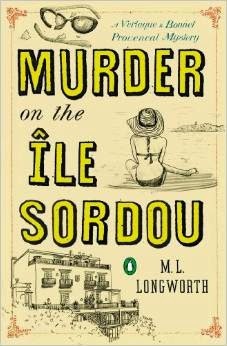 Longworth's Murder on the Île Sordou: A Verlaque and Bonnet Provençal Mystery (Penguin Group), examining magistrate Antoine Verlaque and his lover, law professor Marine Bonnet, have left Aix for a holiday on Sordou, one of a chain of islands off the Mediterranean coast near Marseilles. Their plan is to spend a week in the newly reopened luxury hotel Locanda Sordou, swimming in the brilliant sea, basking in the sun, eating gourmet food – very important to Verlaque – and making love. Accompanying them is Marine’s closest friend, the uninhibited photographer Sylvie Grassi. Other guests at the hotel’s opening week include a retired teacher and minor poet, a married couple from the United States, and a once-famous actor whose best films are many years behind him, along with his current wife and her son. The hotel’s owners have invested everything they have in the hotel’s renovation, and have hired a good selection of employees: a manager with a plan for the future and a dark and mysterious past; a handsome man-of-all-work who is not averse to consorting with women guests; a scholarly and ultra-competent bartender; a brilliant young chef who feels he has landed the perfect job; a hard-nosed laundress and housekeeper; and a naïve, youthful maid. There is also Sordou’s only permanent resident, a wildly eccentric former lighthouse-keeper. Verlaque and Bonnet’s island idyll is interrupted – as you knew it would be – by a murder. With help from his police subordinates, Verlaque takes charge of the investigation, which is complicated when a monster storm cuts off communications with the mainland. This is the fourth Verlaque and Bonnet novel by Longworth, a Canadian and a long-time resident of Provence, and a veteran travel and food writer who beautifully invokes the landscape of the story and the cuisine that so fascinates Verlaque. She is also a dab hand with the many well-developed characters and the Agatha Christie-like plot, moving the action along with a series of revelations and discoveries that lead to a satisfying and surprising conclusion.